Released in conjunction with Balkan Beat Box's Spring/Summer 2008 tour, this exciting double-pack contains 11 audio tracks, a music video, and a 26-minute film. Most of the tracks are fresh remixes derived from BBB's acclaimed 2007 album Nu Med (for "New Mediterranean", a title which is both a musical and a cultural/political statement). Featured remixers include Dub Gabriel, Nickodemus (both from Brooklyn), Italy's Stefano Miele, UBK (aka BBB and Boom Pam guitarist Uri Kinrot), as well as three as-yet-unknown producers who submitted reworks to a Balkan Beat Box remix contest: Mr Tunes, Cheffy Chef and Puzzel. The band themselves created their own remixes of Habibi Min Zaman and Joro Boro. To round off the selection, there's also Balkan Beat Box's reinterpretation of Romanian band Mahala Raï Banda's Red Bula, as well as a brand-new track entitled Ramallah-Tel Aviv, a song with politically-charged lyrics in Arabic and Hebrew, urging the Israeli and Palestinian youth to distrust their respective leaders and look towards forging a new, peaceful future together. The DVD features a 26-minute film directed by Elsa Dahmani, documenting a special event put together by Balkan Beat Box in Tel Aviv in February 2008. After years of performing around Europe and the USA (where the band was formed), this was the band's first large-scale show in the country most of them grew up in. For this circus-like show, the band's 6-member line-up was augmented by a host of guests including Kurdish and Bulgarian folk musicians & singers, as well as ex-Minimal Compact guitarist/singer Berry Sakharof for a version of a Greek pop tune from the '60s. Also included is a live video for Hermetico, based on footage shot in various festivals. 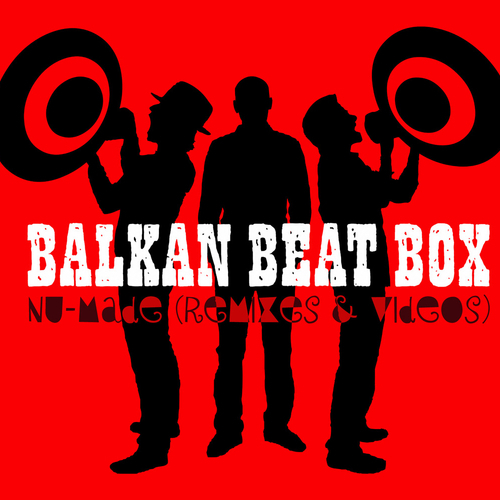 Unfortunately at this time we can't offer all the Balkan Beat Box - Nu Made (Remixes) tracks as individual flacs, as some of these tracks exceed the shops maximum (9mins) download length.